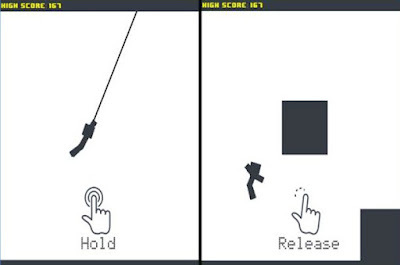 If all of the old, already mastered Android games are getting boring to you, here is one fresh from the oven, called Pixel Rope: Endless Rope Swing. This Android gaming app can be easily found in the Arcade category on Google Play. The developer team, Queleas, made it easy to play, but hard to master, so there is no doubt that this game will provide any player with hours of entertainment. Get ready for addictive gameplay that features endless rope swinging. You play with a unique character and your main objective is to swing as far as possible in order to get higher scores. There are many levels to go through, so time your taps and swings and try to reach higher levels. Unlock the amazing achievements while you play and fight with the rising difficulties on your way, such as your hook rotating and speeding up, etc. You will be able to compare your scores with thousands of worldwide players as well. The game features an online leaderboard where you can see where you’re at. Pixel Rope: Endless Rope Swing is designed in a retro way, with great pixel art and rag-doll physics. It is truly a challenge for any player, no matter the age. Download it now from Google Play and have fun!